Tropical Suites: built directly over turquoise Caribbean waters offering breathtaking views, with 16 guest suites, a 3 bedroom Presidential Penthouse, and a Luxury Studio Apartment. 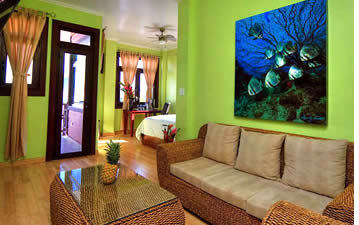 Simply put Tropical Suites is Bocas del Toro's premier upscale boutique hotel. Palma Royale: Bocas del Toro's latest upscale boutique hotel is located at the end of main street, only 20 meters from the Caribbean Sea and has 15 suites exquisitely furnished and decorated with marble and bamboo flooring, handcrafted cedar doors and beds with pillowtop mattresses. Situated over the enchanting Caribbean Sea, Tropical Suites is the premier boutique hotel in Bocas del Toro. Renovated several years ago, the hotel is comprised of 16 modern and fully equipped guest suites, along with a 3 bedroom Presidential Penthouse, and a Luxury Studio Apartment on its top floor. Tropical Suites is just a minute's walk away from restaurants, cafes, and more! However, it sets just far enough away from all of the movement of the town center for guests to relax and unwind in the modern comfort of its rooms. All guest suites offer crisp, open spaces, contemporary furnishings and sliding-glass doors that open into natural airiness of your own private balcony. Whether you decide an Ocean or Island View Suite is right for you, here is what you can expect in each of the 16 spacious and newly designed suite at Tropical Suites: Serta Pillow-Top Beds with premium linens, private-panoramic balcony (built over the water or with Town Center view), full Jacuzzi bathtub with shower, premium LCD flat screen TVs, fully equipped kitchen (pots, pans, dishes, glasses , cutlery, cooking utensils) with minifridge, coffee maker and 4 burner stove, handcrafted, solid wood furnishings and indigenous artwork / adornments, premium air-conditioning and water heating systems, and luxury spa bathroom amenities. 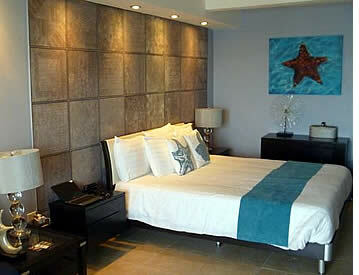 All of Tropical Suites' Ocean View Suites are appointed with one king bed as well as a full size pull-out sofa bed. 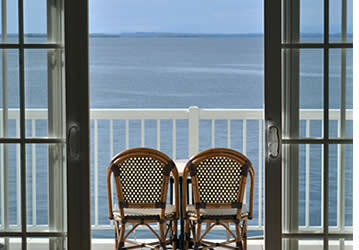 Most Island View Suites are the same, however select Island View Suites are appointed with two double beds. All rooms can accommodate up to four adults comfortably. Tropical Suites was built taking into account Bocas del Toro's nightlife so even though you'll be quite close to where it all happens, its soundproof suites will ensure you always have a good night's sleep. Also, included in all packages at Tropical Suites is complimentary wireless internet access, daily maid service, 24 hour security via infrared camera system and security guard while you sleep, plus so much more. Experience a cooked to order breakfasts at one of two local hot spots as part of your guest amenities package at Tropical Suites. Guests can select Caribbean style cooking, with a beautiful Ocean view at Lilli's Water-top Café. 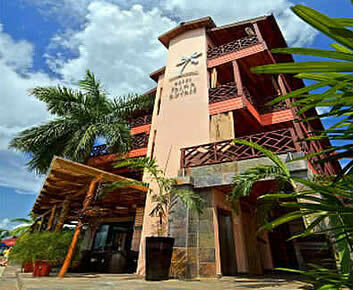 Located next door, guests will enjoy a leisurely breakfast with variety of healthy and freshly prepared menu options. A local favorite! Guests can also choose The Pirate Restaurant and will find local Panamanian flavors, with a relaxed Caribbean Vibe. Located just down the street, guests will enjoy traditional Panamanian fare with bold flavors and a variety of hearty menu offerings. For the rest of your meals, enjoy any of Bocas del Toro's restaurants located within a 5 minute walk or cook your own meal within the convenience of your room. There are plenty of supermarkets in town or let our staff do the shopping for you. Room grocery stocking service is available for 10% stocking fee. Included as one of the best Hotels in the Province of Bocas del Toro by Frommer's and the Lonely Planet, Tropical Suites has been been ranked as one of the Top 5 hotels in the nation of Panama by TripAdvisor reviewers. Tropical Suites is the perfect hotel for Habla Ya students who seek luxury and comfort in the Islas of Bocas del Toro while improving their Spanish. With a motto of "escape, relax, and enjoy" guests are guaranteed to experience some of the best views in town with five star luxury, service, and amenities. The Palma Royale is the newest upscale lodging option launched on Isla Colon. Having opened its doors at the start of the decade it has already earned its reputation as one of Bocas del Toro's finest boutique hotels. 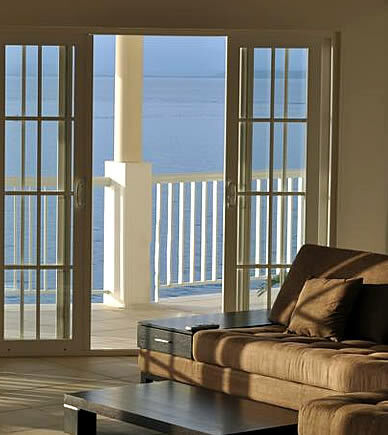 With an open Caribbean architecture complemented by tropical sourced marble, bamboo floorings, handcrafted cedar doors and rattan furniture, Palma Royale will provide you with modern comfort and a bright and breezy feel. Its friendly bilingual staff genuinely will make sure your Panama vacation is a truly memorable one and will provide you with first class customer service and help you with anything and everything you could possibly need. The Palma Royale has 4 floors of air-conditioned rooms, with designer marble bathrooms and a tropical and spacious atmosphere. On the ground floor you'll encounter the Studios, which have queen sized beds and their own outdoor private patios with garden views. 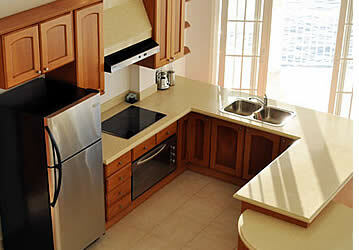 The Studios vary in size and those located more to the rear of the property have a more private touch. The entire building has been extremely well built and even when the hotel is completely booked guests won't really notice if they have neighbors. The upper floors are home to the Suites and the Penthouse. The Double Suites have 2 queen sized beds each and a living room area. The Deluxe Suites have a fully equipped kitchen and their living room area is in a separate room from the master bedroom which also has a queen size bed. 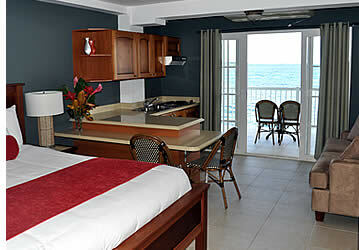 All of the suites have their own private balcony with ocean and mountain views. The last floor is shared by two Deluxe Suites and the Penthouse Suite. 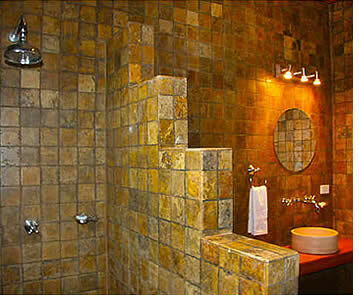 The Penthouse Suite has 2 private bedrooms with queen sized beds and their own private bathrooms. A large living room area, a fully equipped kitchen and a laundry room with washer and dryer are exquisitely complemented by a wrap-around balcony and a jacuzzi tub. The entire hotel is served by an elevator just in case you're tired after a long day of Spanish learning and exploring Bocas del Toro. Every single room at Palma Royale has: daily maid service, mini fridge, free wi-fi internet, pillowtop mattresses, guest laundry service, gourmet coffee and coffee maker, rain shower heads with hot water, desk with large bamboo mirror and leather chair, quality rattan furniture, large windows and french doors, handcrafted cedar doors and beds, ceiling fans, marble and bamboo flooring, 32'' flat screens with satellite TV and fresh flowers. The Penthouse has a 42'' TV, a Bose music system and an iPod dock. As a guest at the Palma Royale you'll enjoy the convenience of being just a short boat ride away from Bocas del Toro's most stunning beaches but surrounded by luxury and first class facilities. The attention to detail at Palma Royale is notorious and they have one of the best staffs in Bocas. 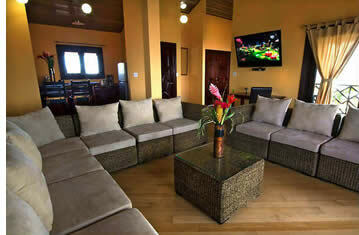 At the reception they can help you arrange any of the activities that Bocas has to offer. And last but not least, having a nice restaurant and bar at your hotel is always a plus. The restaurant is open for every meal and a complimentary breakfast is served featuring fresh fruit, local coffee and a choice of French toast, omelets or pancakes. * Please note: prices are in US Dollars. 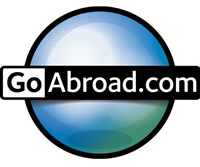 Rates DO NOT include Panama's 10% Hotel Tax. Rates are for single or double occupancy. 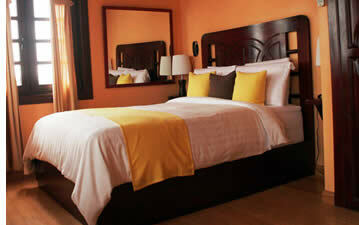 For each extra guest add $10 USD per night (in Double Suites only). Children below 12 years of age stay free if sharing parent's bedding (an extra bed can be added for $20 a night). Peak Dates (PD) are from December 29 - January 1. Holiday Season (HS) includes Carnivals, Holy Week, November Festivities and December 24 - 26. Normal Rates (N) apply during the rest of the year. Discounted weekly and monthly rates do not apply during Peak Dates or Holiday Season. Monthly rate is based on 30 days. Reservations require a valid credit card (Visa or Mastercard) and may be cancelled within 30 days with a one night cancellation fee (at normal rate). Reservations cancelled within 15 days before reservation dates incur in 50% cancellation fee. No shows and cancellations within 24 hours are billed for their entire stay. Reservations made during Holidays will be charged 50% of the total cost and the remaining 50% 5 days before arrival. Unique and exclusive Panama experiences! Spoil yourself in Bocas del Toro... Contact us!